Innovative capacity, quality of life and products, style and sustainability - that is what Villeroy & Boch stands for. The company's centuries of corporate history are marked by a spirit of invention and experimentation. In 1975, Villeroy & Boch first viewed the bathroom as a "living space and place for regeneration" and revolutionized the industry by developing an integrated design line for all bathroom components, which also considered functional aspects of the room and allowed individual color design. Villeroy & Boch sets global standards with its innovative ideas and outstanding collections like Villeroy & Boch Subway. The company has already won several prizes and awards such as the Innovation Prize of German Industry in 2004 or the quality seal of Design Zentrum Nordrhein, the red dot design Award. Villeroy & Boch has already received the latter ten times and the company was again one of the winners in 2014, this time for the Architectura MetalRim shower base. This honor is awarded for ecological compatibility, innovation, aesthetics and functionality. Villeroy & Boch still stand to its claim of turning the bathroom into a wellness oasis and finding total solutions for it. 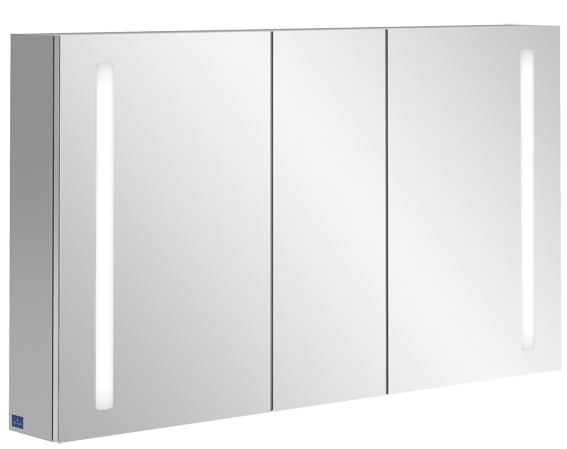 This is shown by the extensive product range for all areas of the bathroom. Villeroy & Boch was founded by the Lorraine iron founder Francois Boch, who decided to start producing ceramic tableware in 1748. Through material experiments, the company achieved a continuous improvement in product quality. At the beginning of the 19th century, Villeroy & Boch made through a deceptively genuine imitation of porcelain, tableware, which had previously only been reserved for the nobility also affordable for the majority. But not only that, Pierre-Joseph Boch founded the social work of the Antonius Brotherhood in 1812 with health-, accident- and disability- insurance as well as a pension fund, in which employees and company equally paid and which Bismarck 70 years later served as a model for German social insurance. Boch merged with the earthenware manufacturer Villeroy to compete to European competitors in 1836: the company "Villeroy & Boch" was founded and combined all the strengths of its founders such as innovative capacity and entrepreneurial spirit. When Eugen von Boch was commissioned by archaeologists to restore a Roman mosaic floor in 1852, this later inspired him to produce floor tiles. Villeroy & Boch began the large-scale production of bathtubs and toilets around 1900, thus making an important contribution for laying the foundations in modern hygiene, which was not a common practice at that time. Villeroy & Boch is today an international "lifestyle provider" with corporate headquarters in Mettlach an der Saar and production facilities all over the world, which focuses on an integrated product range in the areas "bathroom and wellness", "tableware" and “tiles and kitchen”. WHAT IS SO SPECIAL ABOUT THE PRODUCTS OF VILLEROY & BOCH? Villeroy & Boch attaches great importance to the best product quality. The company has developed special materials, surface coatings and technologies that guarantee a high standard. TitanCeram: The material is made from feldspar, quartz, clay and titanium oxide and thus from natural raw materials. The special solidity of the material enables precise shapes and thin wall thicknesses that are robust and resistant at the same time. The TitanCeram mixture is produced in-house by Villeroy & Boch. Quaryl: The material is used for shower trays and bathtubs and consists of natural quartz stone and high-quality sanitary acrylic, from which the name derives. Shower and bath tubs made of this material are particularly impact-resistant, scratch-resistant, permanently colourfast and UV-resistant. The gloss of the surface remains even after years of use and the smooth and non-porous surface can also be easily cleaned. Another advantage is the good thermal insulation, which has a positive effect especially on bathtubs and keeps the water warm for longer. Thanks to the production from the same cast, the tubs can convince with a seamless surface and precise, sharp edges can be achieved, which contribute to a shapely look. CeramicPlus: CeramicPlus is applied sustainably to ceramics and ensures that the water drains off directly in drops and does not stick to the surface. As a result, less limescale and dirt residues remain on the ceramic and you get an easy-care product. Further advantages of the CeramicPlus surface are scratch resistance and insensitivity to alkalis and acids. It is important for the maintenance of the easy-care surface that it is not treated with abrasive milk, aggressive cleaning agents or chlorine-containing agents. AntiBac: AntiBac is baked directly into bathroom ceramics and toilet seats and reduces the growth of bacteria using silver ions by more than 99.9%. The toilet is protected in the long term because it is a glaze and the use of cleaning agents can be significantly reduced. The effect of AntiBac has been confirmed by the BOKEN Quality Institute and also dermatologically tested. AntiBac is available for washbasins and toilets. TitanGlaze: Unlike the other ceramic surfaces, the TitanGlaze surfaces impress with a matt appearance. The coating of crystalline aluminum oxide is particularly scratch and impact resistant and thus retains its attractive appearance for years. Combined with the CeramicPlus surface, the TitanGlaze ceramics are additionally particularly easy to clean. 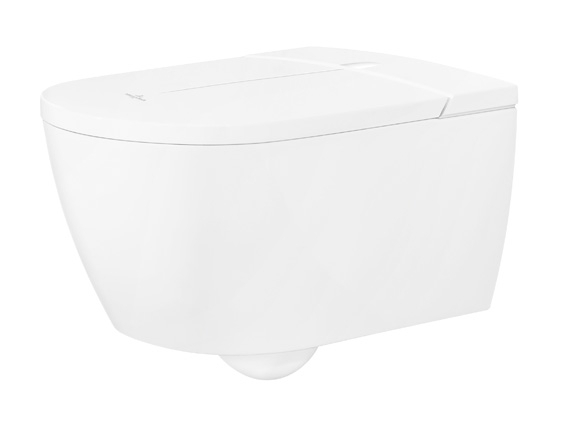 DirectFlush: Thanks to its design, the rimless WC by Villeroy & Boch is particularly easy to clean. The almost germ-free cleaning was even proven by one of the leading hygiene institutes in the Netherlands. With a flush volume of 3 / 4.5 l of water, the entire toilet bowl is flushed, making Villeroy & Boch better than the norm. In combination with AntiBac, the cleaning performance can even be increased again. ViFresh: The ViFresh toilets have integrated into the ceramic at the water inlet a compartment in which commercial toilet stones or gel fragrance stones can be inserted. With each flush is then evenly distributed the active ingredient in the toilet. The advantage here is that the toilet stone remains invisible and still unfolds its effect. The filling of the compartment is hygienic, because the toilet edge has not to be touched. ViPrint: With ViPrint you set new design standards in your shower. The ultra-slim Subway Infinity shower tray gets combined with the decors and patterns of ViPrint to create an individual shower tray. This combines the advantages of a conventional shower tray with the design variety of tiled showers. ViPrint is available in 20 decors and offers both standard sizes and custom cutings. Since the decors are part of the glaze, they are permanently resistant to color. In addition, they provide with the anti-slip class A for a secure footing. EasyAccess: EasyAccess is a push & pull siphon with a collecting box, which makes it easy to clean the drain. In addition, objects such as jewelry that have fallen into it can easily be taken out of the drain. Whisper: The Whirlpools with the Whisper function are particularly quiet during use, namely only as loud as a rustling leaves. They fulfill DIN 4109, which was tested at the Fraunhofer Institute. In addition, 70% more powerful side jets have been installed in these second generation hot tubs, improving energy efficiency. 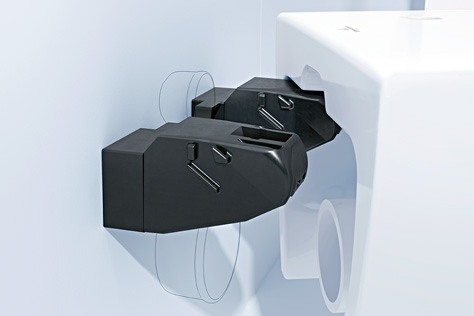 SupraFix 2.0: SupraFix 2.0 is the invisible fastening for wall hung toilets, which only requires one person for the installation. Instead of a lateral attachment, the SupraFix toilets are attached from above, which also brings benefits for the design, since the attachment is not visible. ViProtect: ViProtect can be installed as sound insulation between the toilet and the wall and reduces the sound transmission and thus the volume when flushing the toilet. The polyethylene foam board is only 4 mm thick and can be cut to size. Prodetect 2: With Prodetect 2 your urinal can be controlled via app in the future. Adjustable are the flushing amount of 0.8 - 4 l and additional features such as a water-saving mode and a hygiene flush. The control can be done by battery or mains operation and an optional Bluetooth interface, the urinal can even be maintained without it must be dismantled. Architectura GreenGain: Thanks to a new flushing technology in the Architectura WC, only 3.5 liters of water are used per wash. An additional economy button even allows a reduction to 2 liters. Despite the low water consumption, the flushing performance is not neglected: three inlets ensure a clean and evenly flushed toilet bowl.